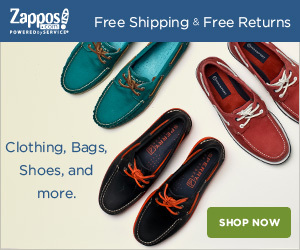 Looking for a particular type of shoe listed above? Use the links to jump straight to it! Furthermore, we’ll also offer a few tips on how to soothe tired feet from standing all day. If your busy schedule doesn’t give you time to explore the shoes below, use the Quick Buy Guide to jump straight to the retailers. Alternatively, scroll down to learn more details about each pair. What Are The Best Men’s Shoes For Standing All Day? Thanks to the leather-covered cushioned insole with the ECCO Comfort Fibre System, the Lisbon is very comfortable all day long. Furthermore, the direct-injected polyurethane outsole ensures the shoes remain light on your feet and don’t feel like breeze blocks as the day closes. Featuring a classic derby design, the Lisbons are versatile for a number of dress codes. For instance, they look great with chinos just as much as a typical business suit. Therefore, they’re great for both the office and nights out. We’re especially fond of the mid-brown that borders on ox blood, which are much easier to integrate into your wardrobe. Despite being derbies, however, there’s also a dressier black option too. 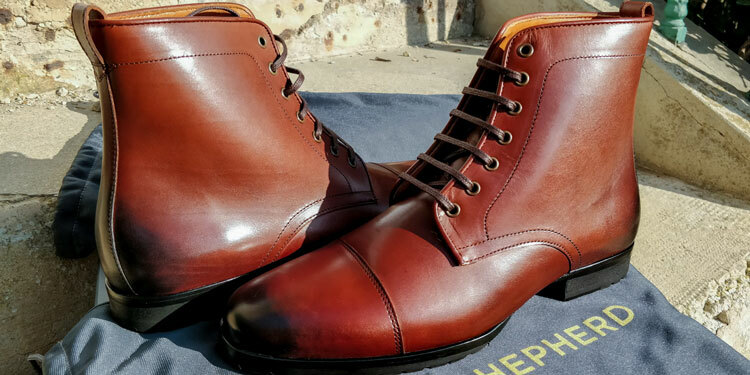 If you’re looking for the ultimate dress shoes to wear for work that will ensure comfort through even the most arduous days, Wolf & Shepherd have designed a masterpiece. A high-density EVA foam heel, reminiscent of both orthotic and athletic shoes, makes these feel like slippers when standing up. Perfect for the office, these are designed like classic Oxfords, which can be worn for almost any formal event. Whether you’re in a typical suit and tie or attending black tie events, they’ll blend right in and look wonderfully elegant. Whilst a tan “honey” and mid-brown “maple” are also available, the best choice for your first pair would be black. This allows you to wear them for more formal events. However, if you are often in more casual settings, the former colours are solid choices too. French brand Mephisto are renowned for making comfortable shoes that can take a beating. Whether you’re standing all day or your feet endure a lot of wear, the Spinnaker insoles will absorb shock and ensure long-term comfort. We’re particularly keen on these penny loafers for just how versatile they are to wear. Whether your needs are casual or business casual, they’ll look great with chinos or jeans yet add a touch of class. Whilst we quite like the laid-back attitude of the tan loafers, they’re also available in a Cordovan shade, which is equally if not more elegant. Otherwise, you can choose the black leather for a dressier look. Vionic have earned their name for creating inconspicuous orthotic shoes that blend right in. If your feet take a lot of punishment and you’re looking for a casual boot that offers excellent protection, they’re an ideal choice. Perfect for anything ranging from casual to business casual, these chukka boots are great if you spend your days on your feet. You could (at a push) wear them with a casual business suit, but they may look a little off. 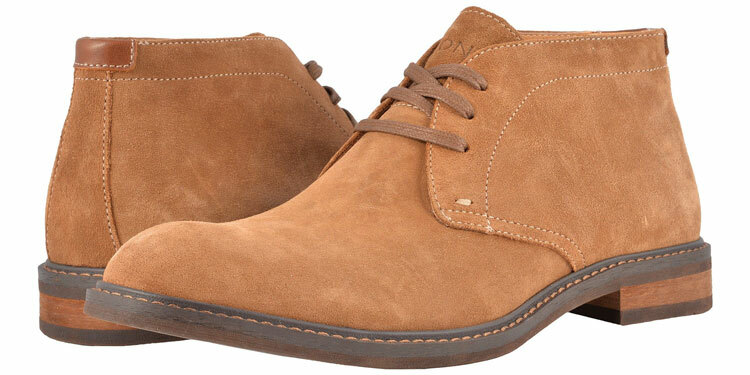 Whilst we’re really fond of the water-resistant tan suede leather, the black boots are somewhat dressier. However, note that black chukkas are hard to style as it’s a formal colour for an otherwise casual boot. Although not as elegant as the Ecco Lisbon, the SAS Ambassador derby shoes are subtle orthotic shoes. This means that they offer even more protection and comfort if you really need it. For those who stand all day and every day for work, the SAS Ambassadors are a very safe choice. Suitable for most professional settings, they can also be worn casually if you need it. If your needs are strictly professional, we’d recommend the black pair as you’ll be able to wear them for all your needs. However, if you require something a little more casual, the brown leather is a versatile choice that can easily dressed down. The Breakaway boots perform flawlessly when standing for long periods. Between the EVA heel and memory foam footbed, they are comfortable to wear and reduce fatigue very well. The Breakaway boots are great to wear with most dress codes. Of course, this generally depends on the colour. However, they could be worn with a suit and jean alike. If you’re looking for boots that respect a business professional dress code, the black Onyx is a good choice. Meanwhile, we’re fond of the burgundy cognac for more versatile wear. 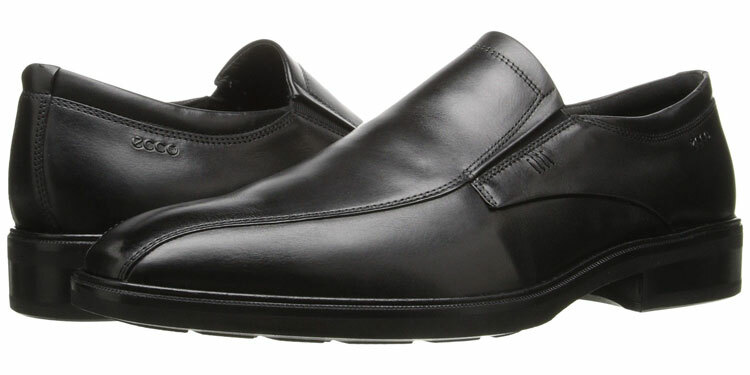 For those looking for comfortable, understated and subtle shoes for standing all day, Eccos also offer very comfortable slip-on loafers. Featuring the ECCO Comfort fibre system and a removable leather covered inlay sole, they’re exceedingly comfortable. If you have a job, which requires you to be on your feet all day, these are perfect. Although they’re not overly stylish, they’re practical, comfortable and will keep you going. However, you can dress up in a refined suit and they won’t look out of place. These loafers aren’t just available in black. Therefore, if you want something a little dressed down and more casual, you can opt for the walnut brown, which is somewhat more stylish. For those looking for the ideal sneakers for standing all day, ASICS’ Nimbus 20 shoes are a great choice. The gel cushion and added support make these perfect for people who stand all day but don’t need to worry about dress codes. These are particularly casual so they are best suited for casual occasions and less formal work environments. They can make for great pair of work shoes for those who work in the kitchen or stand behind a desk all day. If you don’t have to wear black sneakers, you can choose from other very attractive colours such as Island Blue and Sulphur Yellow. 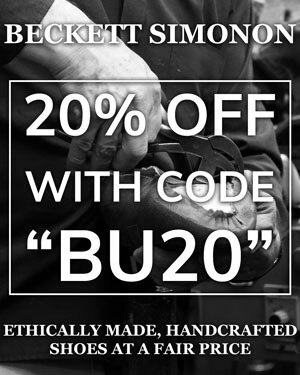 Check out the link above to see the whole range. 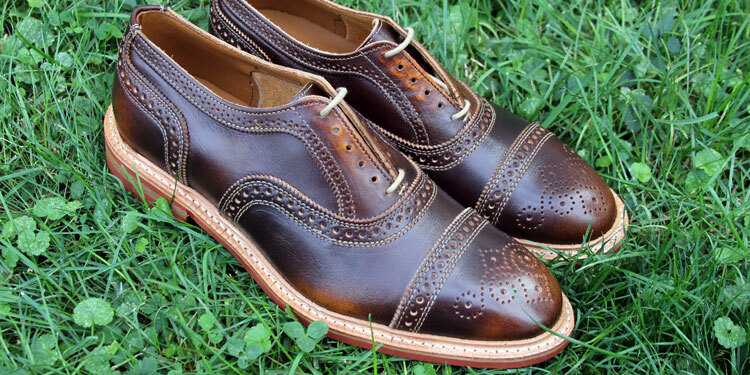 Our favourite brogues come from Allen Edmonds and they certainly leave an impression. With their deep brown leather grain, tan welt and red soles, they’re stunning. Furthermore, the soles are Dainite, which offers shock absorption and there’s a cushioned inner for extra comfort. Despite being quite outlandish, they’re surprisingly versatile brogues. The Strandmoks can be worn with just about anything from jeans, chinos to a full three-piece tweed suit. Although they’re only available in brown, the shoes themselves are very colourful. The vintage-style brown leather is textured whilst the welt is tan and the soles are a lovely rust red. If you work security, the chances are you’ll be standing… A lot. All day and everyday. Therefore, it’s essential to have high-quality boots that’ll make those days bearable and able to leap into action when necessary. We’re fond of Magnum boots but these Timberlands blew us away. Designed primarily for patrol and street work, they feature a premium design. Therefore, if your requirements are more formal and require you to be in parade attire or a suit, they won’t stand out and the composite safety toe can be polished into a beautiful shine. The Timberland Pros are unsurprisingly only available in black. However, it’s unlikely that you’ll need them in any other colour! Even with the best shoes available, you can still get sore or tired feet after standing all day. Unfortunately, this is a reality that many of us must face on a daily basis. When you stand all day, your feet experience circulatory sluggishness, which is caused by gravity. Not only will your feet be affected but you’ll feel tired and may get headaches. Outside of simply putting your feet up, let’s explore a couple of options that are available to you. Firstly, you can use a tennis ball or water bottle to simply massage the base of your feet. Either standing or sitting, place the ball or bottle on the floor and roll one foot after another over it. Of course, the best results are doing this without shoes. However, if you can’t remove your shoes and it’s still the middle of the day, you can still get reasonable results. Alternatively, you can buy special rollers that sit under your desk for doing this. However, as you may be standing all day, you may not have time for a sit down. Ankle Circles: By far the easiest, simply rotate your foot using your ankle when standing or sitting for instant relief. Pulling On Your Toes: When barefoot and sitting down, simply pull gently on your toes to stretch them out to stretch your plantar. Lunges: Taking large steps forward and bending your rear knee helps improve circulation and stretch your calves. Towel stretching: Similar to pulling on your toes, you can loop a towel around your foot and pull gently to stretch out the calves. Calf exercises: Not to be overlooked, pressing against a wall and stretching your calves works wonders. Leg lifts: Lying on your back, you can lift one leg after another in the air to let blood circulate back from your foot. Bicycles: Similar to the above, raise your legs in the air and rotate them as if pedaling. Calf raises: In a standing position, simply lift yourself up and down on the balls of your feet. Even during the day, you can use just a few of these simple exercises for some instant relief. Another classic practice for soothing aching feet is to simply soak them in water. Whilst it’s not always practical to fill up a large bowl or bucket in the middle of your lounge, it has many benefits. Nevertheless, a bowl of warm water for soaking your feet is an excellent way of relaxing. You can add half a cup of baking soda per gallon of water to help improve the experience. Doing this only once a week for 20 minutes allows your muscles to relax. Some say that a tablespoon of mustard with a teaspoon of cayenne pepper in the water really helps. However, you can add some essential oils such as lavender instead for some therapeutic relaxation. Probably the best way to stretch out your muscles as well as relax is yoga. Furthermore, yoga can help correct poor posture, which is another cause of foot pain when standing for too long. With yoga, you’ll be able to improve your breathing and circulatory health. Similarly, you’ll experience increased flexibility, better muscle strength and tone as well as boosted vitality. Who doesn’t love a good foot rub after a long day? Whilst we don’t all have understanding husbands and wives that can do it for us, you could always head to the spa or do one for yourself when times are tight. However, it’s much nicer when someone does it for you! Use a cream or lotion to help hydrate the skin and soothe the muscles in order for the massage to be more effective. Having read about the best men’s shoes for standing all day, perhaps you’d like to take a look at some related guides for more shoe shopping advice? Reviewed by Matthew N., on 30th November . "My feet aren't tired and sore anymore. I wait tables and spend entire shifts on my feet. These took a lot of pressure off!"